"Right Brain Aerobics has been designed to enable anyone to open the Right side of their brain, no matter how great a 'Lefty' they think they might be. The possibilities of this work are endless. The practices are both simple and powerful and can be used in any circumstance to create a deeper and more profound experience." -- Craig Weiner, D.C., Creator of Transformational Dialogues, Host, Change Your Mind Radio & Director, The Chiropractic Zone. See Dr. Craig's blogs on using Right Brain Aerobics: "Teaching Impossible Things: A Right Brainy Kind of Day" and "Unexpected Results When Beginning transformational Dialogues with Right Brain Start Up"
"With Right Brain Aerobics my conscious limitations dissolve into an expanded sense of freedom. Thought is effortless, boundless. I have access beyond my ordinary limits. I highly recommend it!" -- Roy Ozanne, M.D., H.M.D. "With Right Brain Aerobics, the inner genius of each individual as well as the collective genius of everyone in the organization will surprise and delight with amazing ideas and dreams previously thought impossible. Brainstorming sessions have resulted in samplings of how ping-ponging off each other’s ideas takes teams to higher places faster." -- Maya Hennessey, Maya Hennessey & Associates. Named by Counselor Magazine as one of the top 60 woman making a difference. "Sandra Rodman & Right Brain Aerobics have just been absolutely fabulous! Very instrumental & helpful in changing & moving on in whatever direction I choose to!" Jody Bone, Gallery & Museum Glass Artist & Children's Book Author, "The Little House that Grew" -- Bulding Your Dreams! 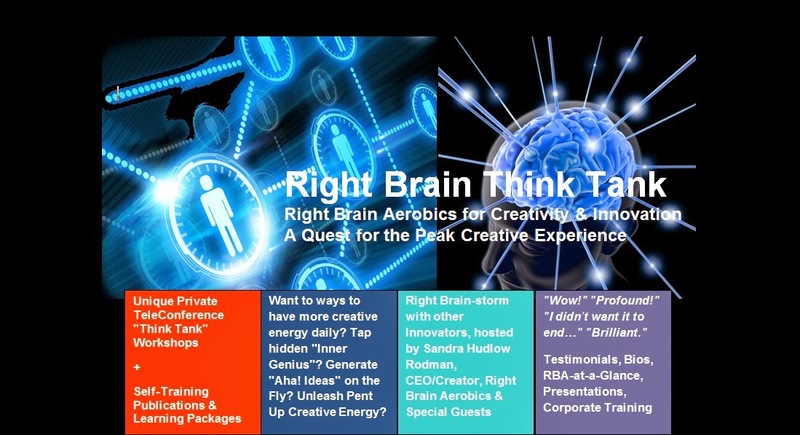 Welcome to Right Brain Think Tank from Right Brain Aerobics: Minds of the Future. | O| NEXT TELECONFERENCE WORKSHOP: By Invitation: 2-3 Sessions, Saturdays, Generally 10:30 am - 12:30 pm Pacific, 1:30 - 3:30 pm Eastern each day. Certificate Class. Details at left. | O| THINK TANK: Mind Building / Right Brain-Storming New Ideas on Technology & Science, Education & Society, Arts & Entrepreneurship... Any Field. |O| DIAL UP YOUR RIGHT BRAIN: Private Conference Call Right-Brainstorming Seminar/Idea Sessions with the CEO & Right Brain Thinkers. |O| SPECIAL EVENTS: InPerson Think Tank Events, Seattle Region. |O| CREATED BY: Sandra H. Rodman, CEO/Creator, Right Brain Aerobics. National Trainer, Speaker, Author, former Fortune 500 VP in technology / communications innovation and decades in creative/theater arts, meditative-intuitive and advanced consciousness arts. |O| FEATURED BY: Information Technology Senior Management Forum (ITSMF) for the Creativity & Innovation Learning Portal and by the Association for Internal Management Consultants (AIMC). |O| CONDUCTED FOR: Right Brain Aerobics has been conducted for executives of Microsoft, CNN/Turner Broadcasting, Hewlett Packard, GP Strategies, Information Technology Senior Management Forum, Pittsburgh Public Schools, Stevenson University, CSX and more. |O| UPCOMING THINK TANK SESSIONS SCHEDULE: See Left. Phone & Right-Brain-storming Think Tank & Brain Building Classes with the CEO/Creator. 1. Right Brain Aerobics home page. 3. S.H. Rodman and Trainer Bios. 4. 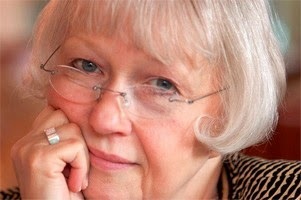 Articles regarding the power of creative-intuitive brain skills at RBA Articles.